Best Free Math Puzzles For Making Math Fun And Engaging. Make math more fun, interesting, and even engaging for students? Free math puzzles are just one of the many ways to enjoy all of what math has to offer. Ready for some math puzzle fun! Let's Go!! Take a look at the three circles below. 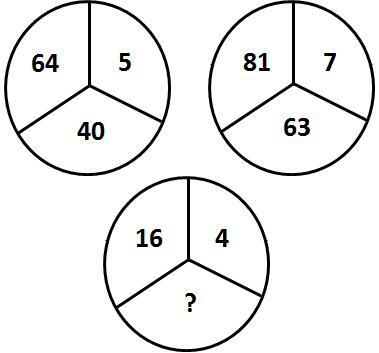 Look at the pattern in the top two, and to determine what number should replace the question mark? You can print these first two puzzles here. Hint: The logic to this puzzle is vertical instead of horizontal. 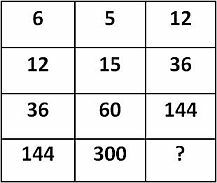 More math puzzles below and you can also go to the main math puzzles page by clicking link near bottom of this page. Benefits of Math Puzzles Using math logic puzzles can help foster a student's creativity and imagination. And it helps to build their problem-solving skills, enabling them to become better math students. Jumping Chips Interactive Math Puzzle: The three red chips need to exchange positions with the yellow chips. Great way to build logical and critical thinking. Place Value Math Crossword: Most of us have worked a crossword puzzle or two. Here's a place value crossword - great for helping kids from elementary students. Multiplication Crossword Puzzle: Print this multiplication crossword off and have fun practicing multiplication tables.